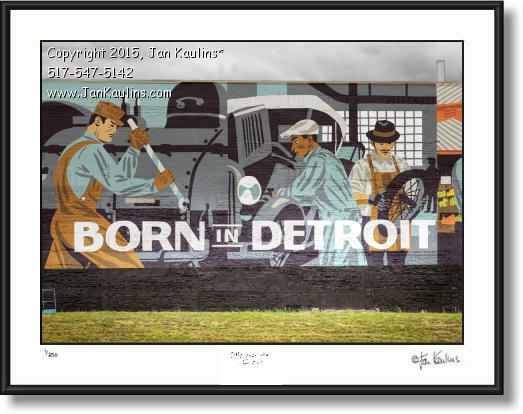 BORN IN DETROIT CARHARTT photo picture art print mural prints for sale. This CARHARTT BORN IN DETROIT mural photo picture print for sale is on the north side of the recently opened Detroit Carhartt retail outlet. Carhartt has been in Detroit since it began in 1889 as a company making strong and durable goods for railroad men and working men. This detail of the wonderful DETROIT CARHARTT MURAL is reminiscent of the Detroit Diego Rivera frescoes found in The Detroit Institute of Arts titled 'Detroit Industry.' The addition of the retail store and the artwork on it are wonderful additions and examples of the continued growth and rebirth of Detroit . This is a relatively new photography technique which uses the blending of the nine multiple bracketed exposures to capture and emulate the way that light levels in the real world vary over an enormous tonal range, from the brightest area of sunlight to the darkest area in the shadows. All of these varying degrees of light cannot be exposed properly and captured in a single photograph---hence the necessity of layering and combining of the multiple over and under exposures to allow the viewer to see all of the existing areas of light at one time in one photo. The enhanced saturation and color of the multiple images also is a partial result of this very unique photographic process and can be quite stunning and dramatic. Please note: I am in no way associated with Carhartt Mfr. Enjoy this collection. If you have any questions please contact me.